Halapoulivaati Vaitai during OTAs at the NovaCare Complex. Leading up to training camp, we'll take a look at every player on the Philadelphia Eagles' roster, and how they fit with the team. In case you've missed any of them, you can catch up here. Before he went down with a torn ACL against the Redskins in Week 7 last season, Peters was having an All-Pro type of season protecting Carson Wentz's blindside. Peters practiced during the spring, though he was on the sidelines during team drills. The sentiment is that Peters' recovery is nearly complete. "The guy is amazing. Amazing... Every guy in our meeting room, to a man, will tell you that he is still the best," said Jeff Stoutland in June. "He’s incredible. I don’t know how somebody recovers that fast. The injuries that he has had have not been like nicks and bumps. "You have to back him off (in practice). I keep saying to him before we go into a drill, ‘Are you good? You feeling anything?’ ‘I feel fine. I feel perfectly fine.’"
If Peters is indeed "perfectly fine," the Eagles will once again have the best pair of offensive tackles in the NFL by a mile. We'll see. I may sound like a broken record here, but Lane Johnson was the best offensive tackle in the NFL last season, not just the best right tackle. Johnson faced the following stud edge rushers in 2017, and shut them all out: Ryan Kerrigan x2, Justin Houston, Jason Pierre-Paul x2, Joey Bosa, Von Miller, DeMarcus Lawrence, Michael Bennett, and Khalil Mack. He allowed just 1 sack on the season (including the playoffs), to the 49ers' Leger Douzable. That is amazing. 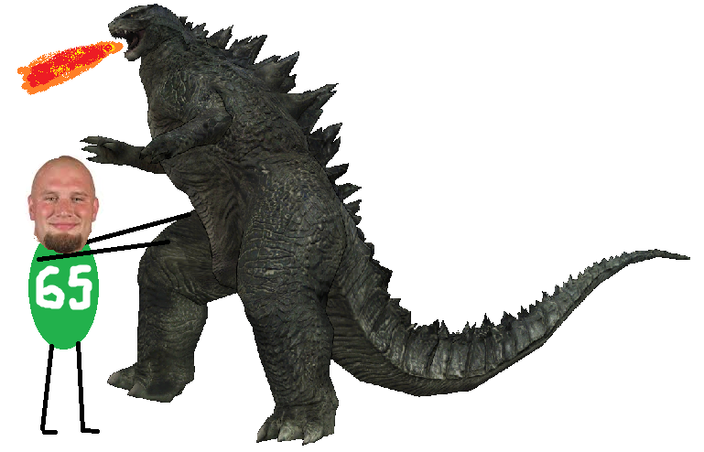 During the Eagles' playoff run, Johnson rhetorically asked, "Who else am I going to see, Godzilla out there?" He'd probably shut out Godzilla, too. While there was certainly a dropoff in play from Peters to Vaitai last season after Peters went down, Vaitai held his own during the Eagles' stretch run, with his biggest moment coming in the NFC Championship Game, when he completely shut down Vikings star DE Everson Griffen. Vaitai plays one of the most important reserve roles on the team (or any NFL roster, really), as capable swing tackles are difficult to find. In 2016, Vaitai was forced to fill in for Lane Johnson at RT, though that didn't go so well. In 2017, when he had to fill in for Peters, he showed significant improvement. 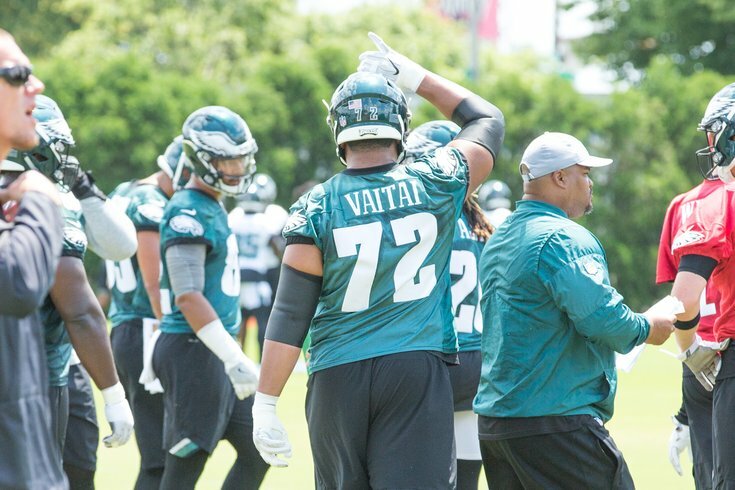 Vaitai should only continue to get better, and he now has experience playing both at LT and RT, affording the Eagles the luxury of not having to make drastic changes along the line, should Peters or Johnson go down. They can simply plug Vaitai in, and not lose much at all in the way of offensive line continuity, which as we noted last month, is extremely important. At 53-man cutdowns last year, I thought Hart had a decent chance of making the team, but he got cut. The Eagles did bring Hart back for a few weeks during the season for depth purposes after Peters went down, but ended up releasing him soon after in favor of Will Beatty. In 2018, Hart will continue to try to develop as an offensive takcle after entering the league as a defensive lineman. During spring practices, Pryor worked with the second-team offense at guard, and with the third-team offense at right tackle. Since there are so many interior offensive linemen to profile, we'll include Pryor here. The appeal of Pryor is his size. At 6-foot-7 with nearly 36 inch arms, pass rushers are forced to take very wide angles to try to get around him. At 328 pounds, Pryor should also be capable of anchoring against power rushes. The downside with Pryor is a lack of athleticism. At one point, Pryor's weight was up near 400 pounds, but he got to 328 by the NFL Combine. In that respect, perhaps the Eagles see a player with ideal length who can become more athletic with better regular conditioning. His length won't matter much if he can't move. If Pryor merely becomes a capable reserve with the ability to play both at guard and tackle, he will be great value in the sixth round where the Eagles drafted him. It's clear that Jeff Stoutland has some clout in the Eagles' offensive line draft acquisitions, as he travels all over the country working players out. At Mailata's pro day, Stoutland came away very impressed. "When you do enough of those workouts – we go all over the country and we work these guys out – there’s a lot of validity to that," Stoutland said. "I think when you leave a workout, like I’ll never forget we left Lane Johnson’s workout, and I was just like, ‘Holy cow, this guy is special.’ You get that feeling, and I had that (with Mailata). I had a really good feeling when I left there. A guy that big, with the way he controlled his body, and the way he took off and ran, I was just very impressed." Stoutland added that learning how to be an offensive lineman takes "years and years." During spring practices, Mailata looked a lot like a guy who, you know, never played American football. He's big and athletic, but he's light years away from playing in a regular season game. What Weathersby does have going for him is LT-RT versatility, as he has played both positions in the same game. While he's not going to be effective in the screen game or at the second level of the defense, perhaps the Eagles can at least try to develop him into a competent swing tackle who is powerful in the run game and sturdy in pass protection. He is a long shot to make the team.